Follow That Dream is an exclusive Elvis specialty label run out of Denmark by BMG. To date there are almost a dozen and a half releases. Here is a review of Elvis New Year's Eve by Norwegian fan Oven Egeland who runs the fan site Elvis Is Still Active In Norway [http://home.online.no/~ov-egela/indexep.html] FTD releases are all officially approved releases but extremely limited. Recorded live in Pittsburgh, Dec 31 1976. An audience recording. Follow That Dream has released a double CD at the price of a single CD. That is a nice gesture, and ought to mean value for money. Personally I would still say no. "Elvis New Years Eve" features one of the most talked about Elvis concerts ever. In Pittsburgh Elvis performed a GREAT show! Only 14 days earlier he did several sub-par shows in Las Vegas, and only one-and-a-half months later he would perform even more sub-par shows while on tour. For many years, Elvis fans have craved for a soundboard release of this particular show. However, to this day it is still not certain if a soundboard really exists. It was recorded for sure, but where is the tape? Rumors even say that a recording does exist, but that it is incomplete. Due to its popularity this Pittsburgh show has been released over and over again on different bootlegs. Almost every time a new release has meant better sound quality. Auld Lang Syne for instance gave Elvis fans a package of two CDs in good audience recorded sound presented in a sturdy package. Several years later a new tape arrived. This was eventually used for another CD release called "Pittsburgh '76". In my point of view, the chain of successively improved releases has now been broken. 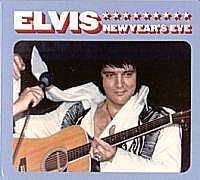 "Elvis New Years Eve" is created from the same cassette as Auld Lang Syne originally stemmed from. The difference in sound is quite obvious, however. Where Auld Lang Syne has lots of atmosphere and punch (and also buzz), Follow That Dream's [FTD] release has a somewhat sterile, thin (and clean) sound picture. You will really have to struggle to squeeze out the bass on this CD. Perhaps a really big sub-woofer would do the thing. Although FTD has used a first generation copy to create their CD, the show has certainly lost some of its demanding appeal. Even more, the concert comes with several digital flaws on the higher tunes (especially the horn section). This is most likely a result of the digital mastering process the cassette has been through before release. This shouldn't shock any, but it has been a while since last time FTD released a CD with these digital errors. The idea behind Follow That Dream was to shed some light on Elvis material not necessarily suitable for a commercial release. A lot of the CDs from FTD have fit into this goal perfectly. That does not always mean that the CD itself is great. For instance, personally I do not like either In A Private Moment or Too Much Monkey Business. I never play those CD's. However, I can easily defend the fact that they were released. I find "Elvis New Years Eve" to be outside this original goal. In this perspective this CD release is a bit difficult to justify. Certainly several fans would welcome this new CD from FTD, most likely those who don't own either Auld Lang Syne or Pittsburgh '76. It is a show that should be heard by any Elvis fan. And FTD certainly helps those who haven't already heard the show. I doubt that the other fans will play this CD very often... I know for sure that I wont. In my point of view it simply isn't good enough!  Are You Lonesome Tonight?